Growing up, my mom would regale us with tales from her high school days growing up in India. Part of that adventure included some amazing world travels: Afghanistan, Nepal, and Hong Kong, for example. I was always intrigued by her accounts of Hong Kong and dreamed of someday seeing it for myself. That someday was February 2017, on my way back from Vietnam. Upon landing, I bought an Oyster Card and took the Airport Express, Hong Kong's super fast and modern train between the airport and Kowloon/Hong Kong island. Bonus: great free wi-fi. I got off at the Kowloon and then took the K3 shuttle to the Holiday Inn stop and walked to my hostel around the corner. I checked into my hostel in the central Tsim Sha Tsui (TST) neighborhood of Kowloon and knew it wasn't going to be a place to meet people. (None of my roommates were ever there and there was no social space/common area.) Wanting to go out and explore the city, but also have a travel buddy, I did what any normal person would do- scroll Tinder. After weeding out the standard creepers (No, dude, I'm not going to answer whether my room in my hostel is a solo room or not), I found David, a nice enough looking guy also from Seattle and in town for a few days. After a brief back-and-forth chat, we found out that our hostels were both located in the same high rise tower so he elevator-ed up to our floor and we set out to explore the city just in time for happy hour. First stop? Butler, a Japanese cocktail bar within a stone's throw from our building. We whisked ourselves up the elevator to a formal space and sat at the counter. The formal service included hot towels to start and an expertly-concocted shiso mojito which the bartender began by carving the ice by hand. After that first drink, we went upstairs to the next bar, Buonasera, where we received more hot towels and this time I opted for a glass of cava. Seeing as it was a Saturday night, a trip to Lan Kwai Fong (the nightlife district) was in the cards so we took the highly efficient MTR and pretty soon we were imbibing in tangy gin cocktails at Ori-gin. 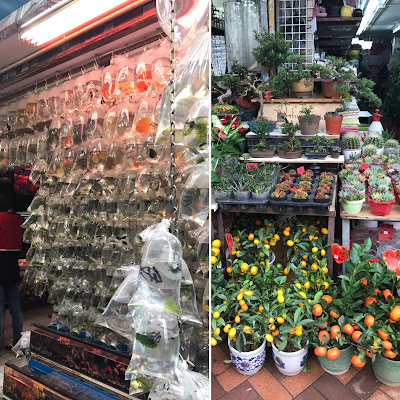 I had Sunday morning to myself to wander and decided on venturing to the Mong Kok neighborhood, a cool area also on the Kowloon side. I had read about the breakfast at Kam Wah Cafe and it was hard to find because the sign was in Chinese only, but once I arrived, I knew I was in a solid place. A stern-looking elderly woman brusquely seated me at a table with a man and his young daughter. Going off the online recommendations, I settled on milk tea, an egg tart (Portuguese influence), and a DELICIOUS warm pineapple bun which I still dream of to this day. After this excellent sustenance, I headed out to explore the streets of Mong Kok. Just like Hanoi, many of the streets were dedicated to selling one type of item. There was Goldfish street, Flower street, Sneaker street, Ladies street, etc. There were some fun little street markets and I bargained for what was probably a fake jade bracelet, but pretty nonetheless! Afterwards, I took theMTR to Soho (Central station) for fancy window shopping and neat boutiques like Seed Heritage, an Aussie label. The Mid Way escalator, the world's longest outdoor escalator, happened to be on the way to my meeting point with David, my travel friend from the night before so I hopped on it to reach the Cupping Room, a nice coffee shop. 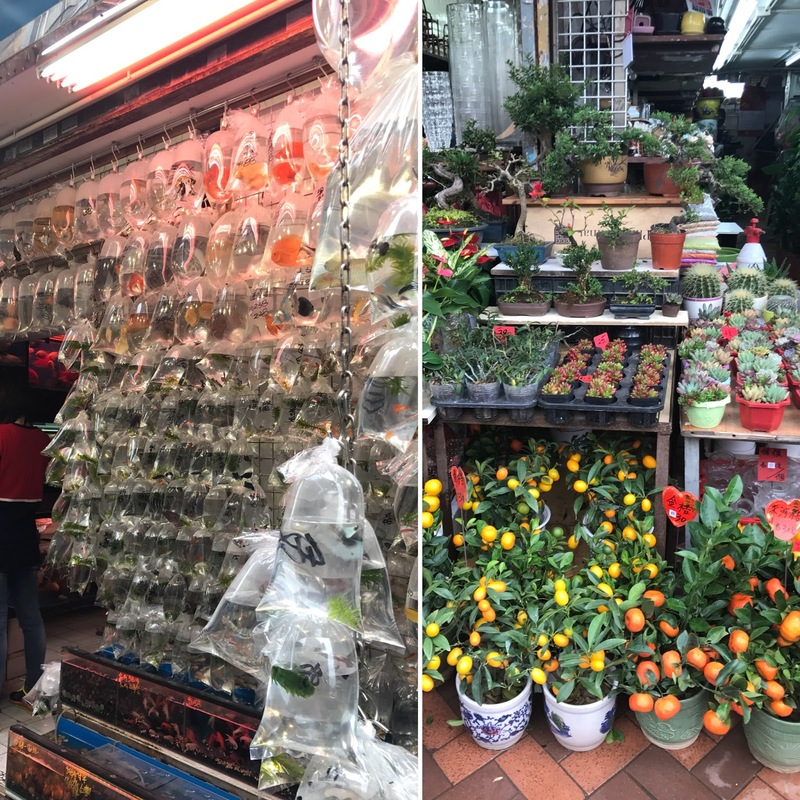 We explored the Soho area, checked out the medicinal herb shops near Des Voeux Road where we also saw dried fish hanging from the street, stepped into a neat temple, checked out a street market and stopped for some a snack where a woman was slicing into the biggest jackfruit I had ever seen. We went to a noodle place on Hennessy for hot and spicy lamb noodles and ventured down the street to Hui Lau Shan for mango sago, a quintessential Hong Kong dessert. We then walked all the way to Victoria Peak (the line for the tram was well over an hour)-what a steep climb but boy was it worth it! At the top of Victoria Peak, we had Prosecco at a Japanese place and decided to take an old school Hong Kong taxi back to Soho/Hollywood Road. We put our name on the list at Ho Lee Fook (a buzzing restaurant), and then went to La Cabane, a French wine bar around the corner where I sipped on white wine while we waited for our table to be ready. The dinner at Ho Lee Fook did not disappoint. 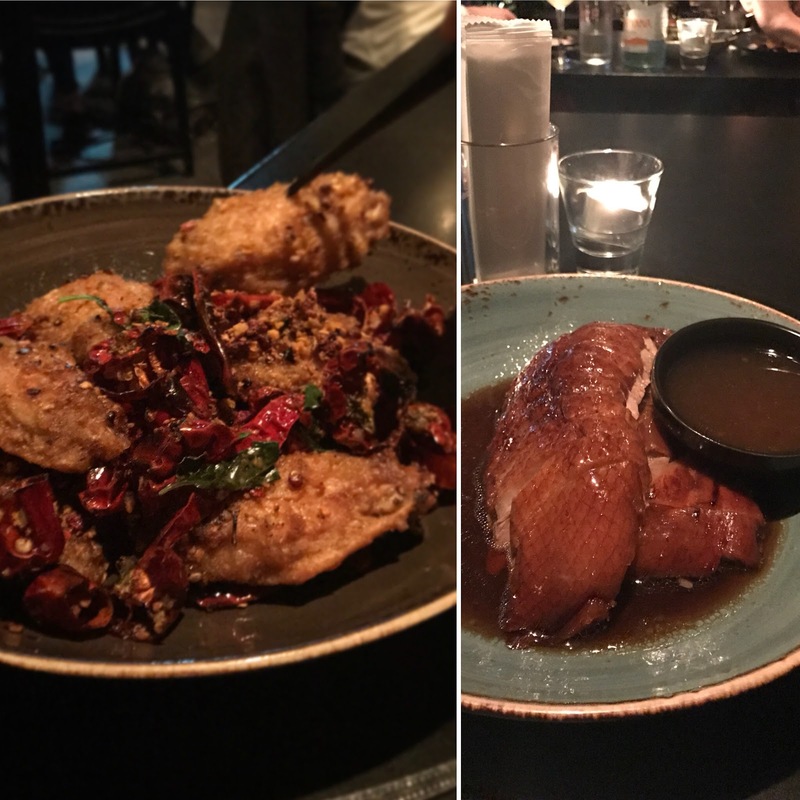 Highlights included amazing spicy chicken wings, delicious and moist roasted goose with plum sauce, oysters and shanghai noodles with nori (great umami). Monday morning: another day, another MTR ride- back to Soho for some Earl Grey tea. There's nothing like Asia malls so I wandered around IFC Mall getting hopelessly lost while attempting to find the General Post Office where I could mail my post cards. After endless circling, my mail was sent off and I met David at the Four Seasons for lunch at Lung King Heen, a 3 star Michelin restaurant (and my first Michelin star restaurant, period). Word was that lunch was the secret to having an affordable meal and it was reasonable overall. 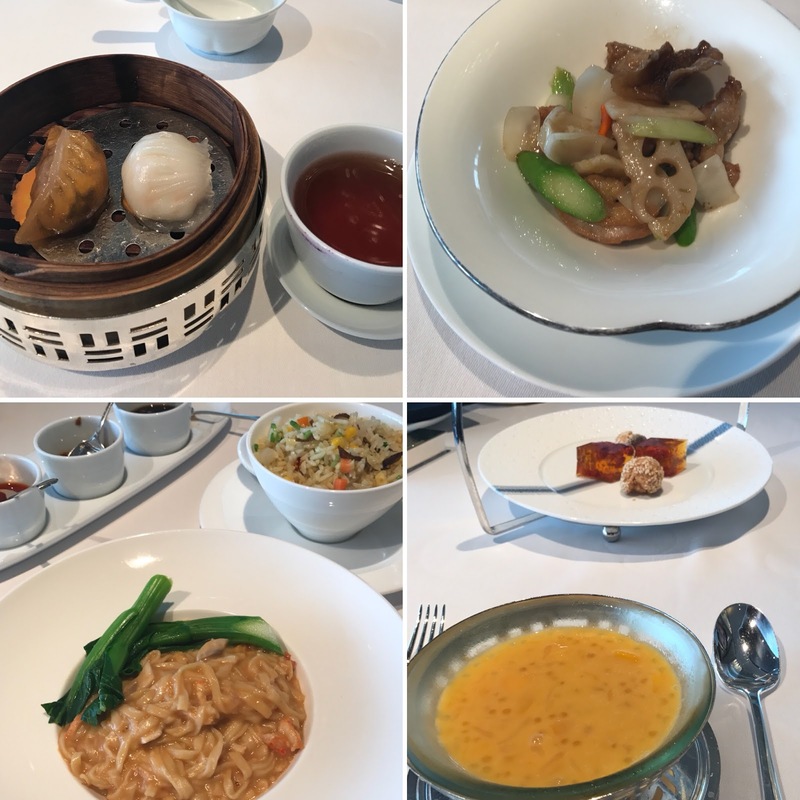 We started off with puer tea, and then selected the executive lunch which included dim sum (beef dumpling with kimchee and a shrimp dumpling), jellyfish (the texture was not for me), roasted goose (one of my favorite Hong Kong dishes), soup, stir-fried quail, and noodles with lobster (too rich, especially for lunch). The meal was rounded out with petit fours and the ubiquitous mango sago. While I'm not too keen on stuffy restaurants and a bunch of showy presentations, it was a fun experience overall. The service was professional but bordering on overly attentive and fussy (they seemed to come by to refill our tea after each sip!) and I'd wager to say that our meal at Ho Lee Fook the evening before was way better. But alas. No trip to Hong Kong would be complete without a ride on a boat, so we took the Star Ferry back to the Kowloon side for some more exploring. 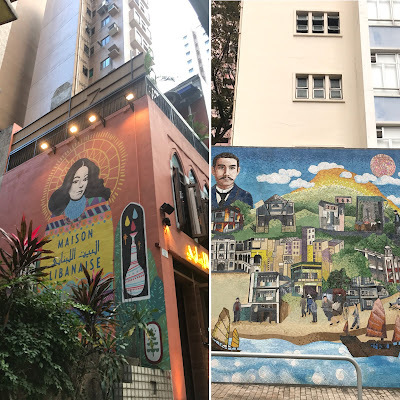 Jasmine's account of the Chungking Mansions intrigued me so that was first on our list (it was just down the street from our hostel building). It is a labyrinth inside! People loiter about the first floor hawking everything from samosas to suitcases to SIM cards to bootleg Bollywood films and everything in between. The smell of competing curries filled the air with stalls selling Indian food. The massive building contains crazy elevators (organized by "blocks" and waits). We took an elevator up after getting lost/trapped in the stairwell and snooped around the hallways. It appeared to be mostly just cheap guest houses everywhere. CCTV cameras were installed recently and you can see them when waiting for the elevators (you can see the people inside the elevators as well as outside the elevator on each floor). Again, an interesting experience!After being cooped up in the mansions, some outdoor time was called for so we walked to nearby Kowloon park and took in some urban nature and saw some cool birds at the aviary. After a quick freshen-up sesh at the hostel, we headed out to Central/Soho yet again for some pre-dinner drinks. Stop one: Quinary Bar for a delicious Pisco lime sour. Stop two: 121bc for a glass of Friulano. Yard Bird was on our list of places to eat but there was a wait so we put our name on the list. A brief stop at Stazione Novella for a glass of Gavi and we were pretty hungry so we stopped at Little Bao restaurant. Yard Bird ended up calling us but we decided to stay at Little Bao and it was a great dinner. We sat at the bar and had tasty smoked eggplant salad w/yogurt and fried Szechuan chicken bao washed down with a glass of sauvignon blanc. Dessert was green tea bao (fried) with condensed milk. All delicious! Ryan, our server, was from HK but had also lived in CA and Vancouver and an interesting person to chat to. He gave us some good recommendations for where to go next. We ended up at The Pontiac (apparently all the HK bartenders go there). We drank more white wine, took in the interesting interior (bras were hanging from the bar) and there was even a Frida Kahlo-inspired bathroom. The bartenders shared some friend shrimp-chocolate (??) snacks with us and recommended Iron Fairies bar (just down the street in an alley) so we headed down there next for live jazz and drinks. The interior of this place alone and the live jazz was worth checking out. After all that wine it was homemade ginger beer for me. The next morning I headed back home on a direct flight to Seattle but I'd say the Hong Kong trip was a success and I'd love to return! Des Voeux Road aka "Dried Seafood Street"
Worth the climb up to Victoria Peak!